Mud, Sleet and Snow are no match for Volkswagens 4MOTION system. 4MOTION is always on and ready for a variety of weather conditions that can interfere with traction on the tires. Winter in London is the perfect time to experience 4MOTION AWD for yourself. Book your test drive today! Which vehicles have 4MOTION All Wheel Drive? 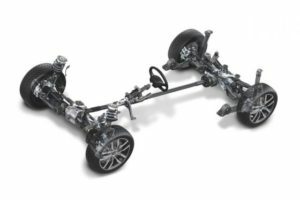 When needed, the Volkswagen 4MOTION All Wheel Drive system distributes power from the engine to all 4 wheels individually. By using the electronically-controlled system, your 4MOTION AWD equipped Volkswagen is able to monitor which wheels have the best traction and direct the power to those wheels. It can also apply the brake to wheels that don’t have very good traction to prevent the vehicle from sliding. When your vehicle senses that road conditions don’t need the 4MOTION All Wheel Drive system engaged, 2 wheels are powered by the engine to conserve fuel. Pretty smart, if you ask us!